As both doctor and patient, Jennifer Bute's personal account of dementia opens up the experiences and challenges that dementia patients face. Jennifer Bute was a highly qualified senior doctor in a large clinical practice, whose patients included those with dementia. Then she began to notice symptoms in herself. She was finally given a diagnosis of Young Onset Dementia in 2009. Jennifer believes that her dementia is an opportunity as well as a challenge. When she resigned as a GP, she resolved to explore what could be done to slow the progress of dementia, and to help people living with it. Inspired by the work of neuroscientist Professor Kawashima that showed significant cognitive recovery in patients with dementia, she adopted the principles of his approach and has produced materials for the 'Japanese Memory Groups' that she runs in the dementia inclusive village where she now lives. Jennifer is in demand as a speaker, both in secular and Christian settings. Her important insights are that the person remains and can be reached even when masked by the condition, and that spirituality rises as cognition becomes limited. Louise Morse is a cognitive behavioural therapist and researches and writes about dementia and people living with it. She is author of many books including Dementia: Frank and Linda's Story. 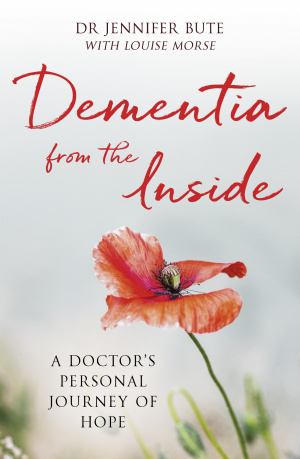 Dementia from the Inside by Jennifer Bute was published by SPCK in November 2018 and is our 1829th best seller. The ISBN for Dementia from the Inside is 9780281080694. Best book I have read about dementia. As a GP. Dr. Jennifer Bute had seen Dementia from the outside but then realised that she was beginning the Dementia pathway although it wasn't diagnosed for another 5yrs. This book is so insightful both for those in the early stages of dementia and their carers and I think it ought to be read by every professional involved and I wish I could give a copy to every carer. Her faith shines out through the pages and the God-incidences are so encouraging. If only I had had a copy when my dad was going through this. Her brutal honesty is helpful and refreshing and there are numerous helps and tips to help manage the illness. Got a question? No problem! Just click here to ask us about Dementia from the Inside.